Made from thin sheets of gilded metal, cut and smoothed using a technique inherited from traditions deriving from the Steppe, this crown consists of a circular headband topped by five trident-shaped branches. Cut in symbolic fashion, these branches seem to evoke the branches of a tree, or the shape of a mountain, or even the wings of a bird. Two small golden chains, imitations of braids, hang from either side of the headpiece at the level of the ear. 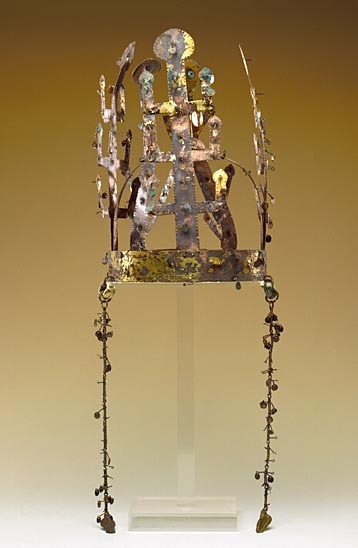 This type of tiara comes from the Silla kingdom (57 BCE-668 CE) and is more stylized and baroque than under the Paekche (18 BCE-660 CE) or Koguryo (37 BCE-668 CE) kingdoms. Stylistic influences are Siberian rather than Chinese. Such crowns have been most often discovered in tumulus-shaped tombs-often of impressive size-along with other finery such as pendant earrings, brooches, belts, swords and, more rarely, shoes made from precious metals. Occasionally the crowns were embellished with jade tiger fangs-closely associated with the shamanistic beliefs known to the Japanese as magatama-which symbolized power and hence royal authority. This extremely fragile headdress was worn by high-ranking figures on special occasions. It is believed to come from a tomb in Kyongsang province and dates from the “Three Kingdoms” period (1st century BCE-7th century CE). The Silla kingdom-together with the Koguryo and Paekche, the southernmost of the three sovereign kingdoms that made up Korea at the time-managed to preserved its traditions intact. It was less influenced by China than the Koguryo, and this crown is among the most characteristic specimens of gold and silverware treasures discovered there.